We are happy to get one more member in our Terahertz imaging club! LASER2000 has recently joined our 28-strong army of authorized distributors and has already ‘hit the ground running’ by securing the first purchase order! 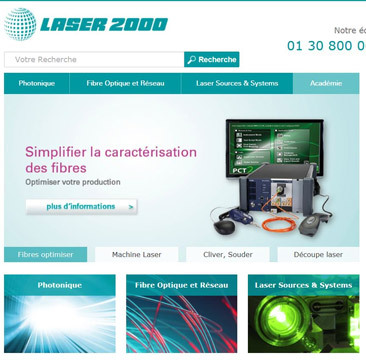 Laser2000 is a world leader in the distribution of photonics products. They provide their customers with products that generate light, modify it, move it, and measure it. Laser 2000 leads the way in innovation by supplying state-of-the-art solutions, utilizing the latest photonics and optoelectronic technologies. They will now expand their product portfolio by attaching our terahertz imaging products, viz. THz sensor arrays (FPA) and cameras, THz sources and Ultrafast detectors. They work in close partnership with their customers to provide customized solutions for even the most demanding applications and should rightfully pride themselves on their unfailing expertise, product quality and reliability. We are confident that the perfect understanding of their customers' needs, as well as capabilities of our THz products, will surely help LASER200 zero in on the best possible solution, for any THz application. All Laser2000 products meet rigorous standards of quality and specification, at competitive prices. They regularly attend trade exhibitions, meetings and events to look out for and review the latest technologies. The suppliers they use are selected following careful consideration of the value they represent to customers, which surely adds value to Terasense! Moreover, Laser2000 team has continuous product & application related trainings with the product developers to provide customers with the best possible support. All that complemented with a wide network of branches throughout Europe should give LASER2000 sustainable competitive advantage and multiply our sales in the region!